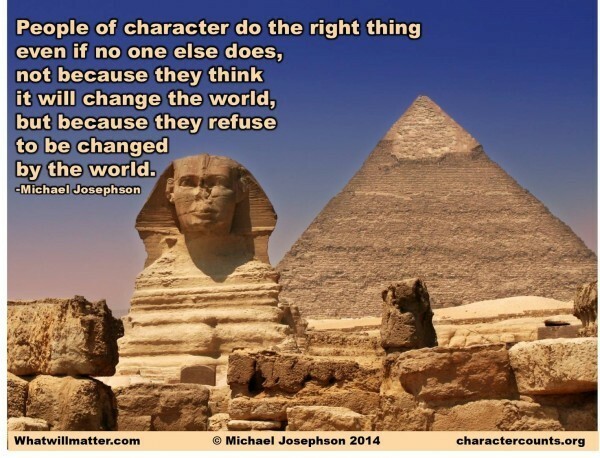 Living a Life That Matters "People of character do the right thing even if no one else does, not because they think it will change the world, but because they refuse to be changed by the world." People who value their character above their comfort do not lead an easier life; they lead a better life. They pay a price when they choose the honorable rather than the profitable path and to maintain their integrity even when it provides no advantage and there is lots to lose. And they do so knowing it is, in the end, a small price to pay for a reputation that will be their legacy. This is such an important and life – transforming thought and mindset. Thank you for promoting it. As my favorite French philosopher said, I quote, “Integrity has no need of rules.” end of quote. No one could have said it better with such short powerful statement. The latter quote is accompanying my life and travels with me everywhere I go.